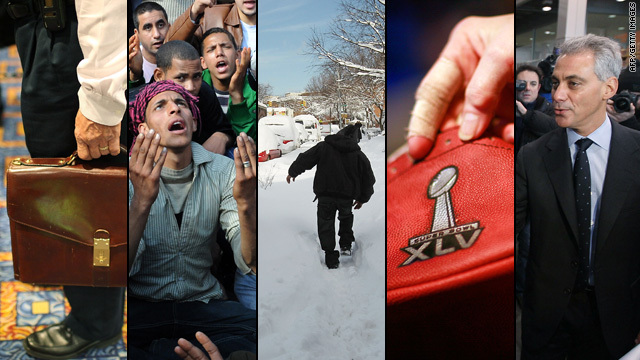 Tired of living out scenes like this in Maryland last week? Well, for big parts of the U.S., there's no relief this coming week. Week after week, the U.S. has been pummeled by severe winter weather since December – and this week will be no exception. Some of the coldest air of the season will plummet southward and combine with another storm developing over the southern Plains. An intense surface low will develop over north Texas and pull abundant warm, moist air from the Gulf of Mexico into the frigid Arctic air diving southward into the Plains. 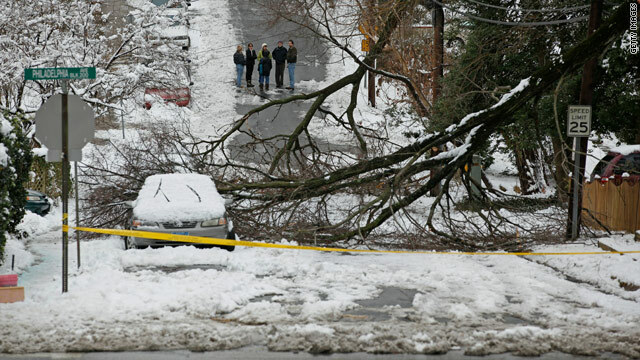 The result: blizzard conditions, heavy snow, ice storms and tornadoes. This storm appears to be another one for the record books. Very heavy snow will fall from Oklahoma northeastward through Kansas, Missouri and Illinois. Snow accumulations here will be measured in feet, not in inches. With massive protests against Egyptian President Hosni Mubarak entering their seventh day and a major opposition leader addressing demonstrators in Cairo, this week is shaping up to be a pivotal one for the country's future. The unrest is starting to affect Egyptians' food supplies and the United States is calling for a peaceful transition in Egypt to democracy. Will Mubarak cling to power in Egypt? Thousands of demonstrators took to the streets of Egypt's major cities last week to demand an end to Mubarak's 30-year rule, prompting the government to deploy the army to deal with civil unrest for the first time in a generation. The protests came after similar disturbances in Tunisia forced then-President Zine El Abidine Ben Ali to flee the country. Both Egypt and Tunisia have seen dramatic rises in the cost of living in recent years and accusations of corruption among the ruling elite. Demonstrations also have taken place in recent weeks Algeria, Yemen and Jordan. 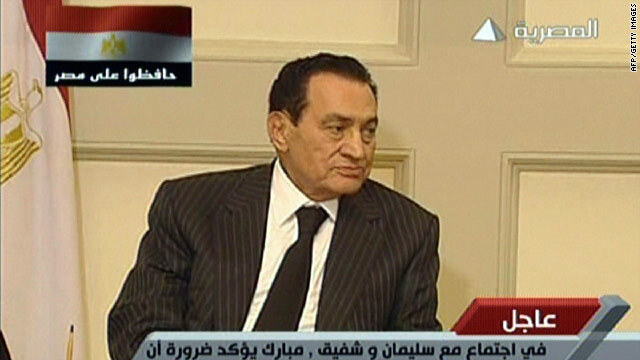 An image from state televsion Al-Masriya shows Egyptian President Hosni Mubarak speaking with his new vice president, Omar Suleiman, in Cairo on Sunday. - [Update 2:04 p.m. Cairo, 7:04 a.m. ET] Protesters gathered in Cairo's Tahrir Square said Monday that they were organizing a "million man march" around Cairo for Tuesday. - Demonstrators also told CNN that they are organizing a "million man march" in Alexandria, but cannot confirm when they will start. - Tony Blair, Middle East peace envoy and former British prime minister, told Sky News Monday that the developments in Egypt have "vast implications for the state of Israel, the Palestinians and the state of the peace process." He also said there aren't just two elements - a government that has long been in power and a movement for democracy - in the situation. "There are three elements, because there is also a very strong Islamist movement in Egypt through the Muslim Brotherhood ... I think that the people of Egypt will not elect a Muslim Brotherhood government." - The Canadian government will begin evacuating its citizens from Egypt as early as Monday using chartered flights bound for Europe, according to the country's foreign affairs minister. - Following a request from the Thai government, Thai Airways International is preparing for a flight to Cairo to bring back stranded citizens, according to a statement from the company. - Two flights carrying Israelis from Egypt to Israel landed Monday morning, according to an Israeli foreign ministry spokesman. Another flight was scheduled to land Monday evening. - State-run Nile TV reported that police forces were scheduled to start deploying and resume their duties throughout Egypt on Monday. Police clashed violently with protesters last week and have been virtually absent from the streets since Saturday.